Supports Facebook, Twitter, LinkedIn and Flickr. It shows facebook updates and updates from all mentioned social network sites into a single window, making it easier to read, comment, or reply to comments made by your friends. You can post status messages or share links on these social network sites with a single click. You don’t have to login to Facebook, Twitter, LinkedIn and Flickr separately anymore if you use Yoono. You can decide what kinds of updates (for e.g. Status update, New wall post, New note, Application Notification, etc.) to be shown in Yoono updates by simply configuring under Settings. It allows you to configure each of the social network sites . You can also have a username set to use globally on all the networks. You can also configure multiple accounts, meaning you can have two or more Facebook, Twitter or LinkedIn accounts setup in Yoono and it brings updates from all those networks to one single place. I’m not sure about Flickr, I don’t use Flickr yet. You can switch from each network by simply flicking right or left on the screen. To refresh the updates, just drag downwards. You can also translate updates using Google Translate tool appearing just below the updates. It allows to add MySpace, YouTube, Foursquare and FriendFeed in addition to Facebook, Twitter, LinkedIn and Flickr. 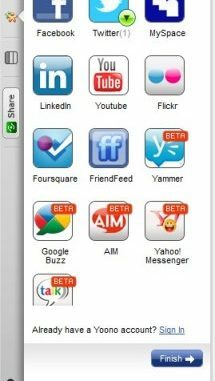 It also has Yammer, Google Buzz, AIM, Yahoo Messgenger and Google Talk in Beta. (I don’t use any of these though). You can have column views in a single browser window, separating each of your social network sites . You can create Yoono Groups by selecting your friends from any network and filter the updates according to these Groups. You can configure to receive popup messages when someone post an update, you can also control what types of updates should be notified via popup. The popup messages appear at the right bottom corner on a Windows PC. It highlights the count of unread messages/ posts at the top bar. You can post a reply or retweet by just hovering your mouse on a post. It also integrates with various services such as TwitPic. You can simply collapse Yoono bar by clicking at top arrow and continue your work or reading your favorite article online. The good thing about this iPhone apps and Firefox plugin is that it brings all of your popular social network updates in a single window. You don’t have to switch between Facebook or Twitter, etc. and sign in to these social network sites separately anymore. I didn’t notice any bugs with both iPhone apps and Firefox plug in yet. One thing I don’t quiet like is the Facebook Message window in Yoono iPhone apps, it looks so plain and boring to read. You should try Yoono if you maintain Facebook, Twitter, LinkedIn, Flickr, etc. and spend much time switching between each one to post status messages or share stuffs with friends. Yoono is already a very popular application used by many people around the world. TechCrunch, one of the leading technology blog, says about Yoono as “the Social Network Plugin You’ve Been Waiting For”. Yoono iPhone can be downloaded from here for free. The free version comes with ads. If you dislike ads, you can also download the paid version. The Firefox plugin can be downloaded from here for free. Yoono also has a Desktop app, but I haven’t tried that yet. If anyone of you have already used the Desktop version, please share your experience with us in the comments area. One thing you need to be extra careful about is when you want to configure Yoono on your Office PC or public computers. Remember to sign out from Yoono and if possible remove each services or be prepared to lose your data and expect worse to happen. Are you already a Yoono user? What do you think about it? Share with us in the comment area.